Central Web Services in partnership with Human Resources and University Business Centers on Friday, with assistance from Enterprise Computing, deployed version 1.0.0 of the EvalS MyOSU portlet application on Friday, September 30th, 2011. What is EvalS? It’s an electronically-driven performance evaluation system designed to assist supervisors and employees to complete their annual goal-setting and appraisal tasks. This project, sponsored by the Provost, was almost a 9 month effort to understand, improve and deliver efficiencies to the evaluation process of Classified Employees (not including IT Classified). As everyone knows, it is largely a paper process, and it takes many person hours to process and work with paper documents. This application is the first step in making that process much easier. Now while we deployed the application, unfortunately the first feedback is for the application’s own performance to improve. So for those seeing it on the Employee page of the MyOSU Portal, and if you have notification of something needing to be done, then it might be just a little bit slow to bring up the appraisal form. Don’t worry though, we are investigating the problem and looking at options to boost its performance, because we know that for you this is not good enough to fully use. The paper process per the notification in the portlet is still available to use, however, if you have the patience, you can use it electronically, until such time as we fix the speed problem. If you do use it, please don’t hit reload multiple times, and don’t forget to save any drafts, and please be patient. Once the application is performing, we’ll put another post out here to talk more about it and the process of development. 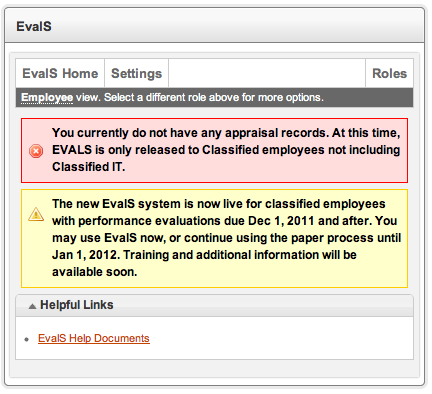 In the meantime, if you want to find out more about it and how to use it, visit the Evals page.